and the results we’ve achieved for our clients. We delivered a final report that outlines high-level strategic directions, as well as recommended concrete steps and specific tactics to help the City of Guelph live its brand promise to ”Make a difference” in the lives of its residents and the community at large”. We have also been retained to provide ongoing support to guide implementation. Our analysis and report of recommendations includes a series of measures essential for the brand to emerge stronger and to provide the foundational elements and ground rules for the positioning and marketing of the Guelph brand in all media. In addition to updating and optimizing the City’s visual identity, simplifying its brand architecture for easier deployment and to affect a consistent brand voice, we provided Guelph with a corporate brand policy, new brand foundation, a brand manifesto and a series of thematically-linked initiatives to reinforce the brand identity and promise. This program exemplifies how ABC+D leverages a client’s existing visual identity and brand style to bring about a completely fresh attitude and personality to an organization’s communication approach. In this particular instance, ABC+D did not create a new brand identity; however, we leveraged the communications strategy work that we had been engaged to develop for the client to exact a bold new creative expression within the framework of a largely lackluster and prescriptive visual branding approach. The result was a fresh, engaging and contemporary attitude that speaks to present and prospective OCOT members, as well as to industry leaders, employers and government audiences, in a relevant and dynamic manner. The Ontario College of Trades (OCOT) is an industry-driven regulatory body that has a mandate to modernize Ontario’s apprenticeship and skilled trades system. The College allows for all tradespeople and employers voices to be heard, protects the public interest, and is responsible for establishing the scope of practice and setting out policies and procedures for the trades. One of OCOT’s mandates is to put skilled trades on a similar footing with teachers, doctors, and nurses, who have their own professional regulatory colleges. One of the key challenges in developing a branded communications system lies in striking the proper balance between conformity and flexibility. The former confers a unified branded look but may also limit the ability for designers and marketers to address future or unforeseen market requirements. One must therefore ensure that the users of the design program understand the essence of this branded approach in order that they may evolve it for their own needs while preserving the purpose for which it was created. Our task began with a sweeping review of the company’s existing suite of marketing materials, as well as that of key market competitors – both domestically and globally, in order to identify strengths and weaknesses of the various programs and map out a new disciplined framework for Sentry Investments. ABC+D conducted a thorough creative exploration that included all visual brand elements including: colour palette, grids, logo, typography, information sequencing, hierarchy, use of positive and negative space, size of pieces and relative sizing/ proportions of elements to one another, formats, use of imagery, messaging semantics, thematic approaches, messaging structure, language tone and personality. No less than nine distinct concepts were explored and presented to the client. Each took into account distinct requirements for various categories and audiences. We provided design prototypes for corporate brochures, for investor and for advisor information materials, for investor education materials, and for third-party dealers sales and marketing support. 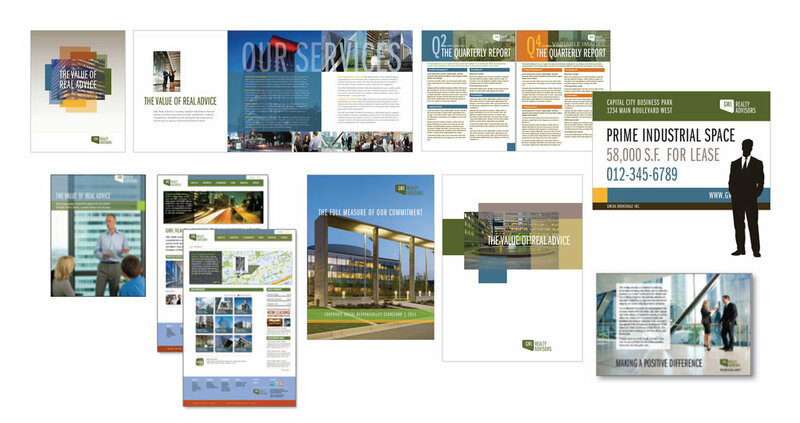 ABC+D also developed publications design guidelines for sales and marketing materials. These garner all the key principles for the creation of communications materials (either internally or via third-party agencies) that ensure the program stays on-brand at all times. Argyle also conducted an exhaustive search to locate, identify and tag imagery for short-term and future/anticipated usage by Sentry Investments over the next 2-3 years. Following the imagery search and tagging exercise we catalogued the selection and built a database of all images to include all relevant references such as category title, description, code number, stock collection (source), URL, rights category, pricing and a thumbnail of each image. Launched in 2000 as the web and digital development offshoot of a typesetting and printing company, Movable Online built a solid reputation of its own to become one of the most sought-after digital consultancies in the country. The company’s legacy brand and positioning however hindered its ability and prospects for future growth. The company reasoned that it required a brand that would sufficiently distance it from its origins, better reflect its intellectual capital, leadership and technical problem-solving capabilities, and position it to take on global firms competing in the Digital Transformation space. In 2016, the firm issued an RFP to a number of leading branding consultancies, and awarded the contract to Argyle Brand Counsel+Design. As we began working together, we all realized the opportunity to create something truly unique. This however would take the willingness on the part of the company’s leadership to leave behind pre-conceived notions of what a successful brand within the digital transformation sector should be, and to look at the category with fresh eyes. This is why we took the client on a journey to envision the future of the digital space. Branding a Digital Firm in a Crowded Space. This meant that the standard themes like “partnering”, “innovation” and “strategic leadership”, needed to be expressed in fresh and surprising ways from what any client had been exposed to before by a digital firm. To help ensure this could happen, the positioning communicated a value proposition that was understood as markedly superior to that of competitors, and helped alleviate any doubt in a prospect’s mind that their interests would be best served by working with the company. However, we quickly confronted the fact that the language of the digital space is stuck in neutral, using the same tired and overused lexicon to communicate its value. We needed to leverage the power of language to develop fresh and more relevant expressions of the brand promise and value, so the market would take notice. – Address wholistic, higher-level business needs instead of just digital needs. – Address clients’ confusion with “digital”. – Help clients diagnose their primary digital needs. – Ensure client feels safe in their choices by demystifying the process. – Redefine not only the work of the company but the entire sector. – Develop a brand to “own” this newly redefined sector. Branding a Digital Firm in a Post-website World. The unpredictable and dynamic nature of the digital space is such that we can only partly anticipate what the next five years will bring. So branding with any sense of permanence in this context poses real challenges. The company had to come to terms with disruption, not just of its clients’ industries, but of its own as well. The unpredictability of the industry and changing digital strategies meant that entire lines of business can be marginalized almost overnight. Painting oneself in a corner with a brand that is too narrowly focused could easily spell future trouble.The company needed brand options that gave it a wide berth and an eminently adaptable core value proposition to adapt to emerging market opportunities and changing technologies. Because of the fluid and fragmented nature of the digital technology landscape, clients are often perplexed as to which type of agency/consultant to hire. We determined therefore that the goal of the rebranding should not be to define our value proposition in terms of the firm’s services, but instead to focus of the business outcomes clients require, regardless of the technology solutions needed to get them there. Our goal became to simplify the client’s decision process by helping them diagnose their primary operational needs, and by reinventing the language of the industry to redefine the digital industry key markers to address those needs. In this context, the company needed to be the David to the digital transformation sector’s Goliaths. The opportunity was therefore: To be “categorically” different by redefining the category rather than to be defined by it. To develop a brand and core value proposition to “own” the category… what every good brand should aspire to do. Following this thinking, we were able to pack the positioning with a potent emotional punch that would lift the company above the fray and create unique story/narrative opportunities. This also provided the inspiration for naming the company in the most propitious way. We also agreed that with these key principles backed by solid selection criteria, the naming exploration could be streamlined and highly focused on only those names that were strategically delivering against these principles. This meant that we could eschew the all-too-common practice to develop hundreds of names, an approach we consider a waste of time and certainly not one that is respectful of the client’s time and intelligence. To build cohesion and unity around the new brand and to have employees emotionally invested and engaged in delivering against the new Core Value Proposition, we developed a Brand Manifesto that became the focus of animated discussions and allowed employees at every level of the company to provide input into a shared vision of the new brand. Present a New Face. Communicate an Expanded Mandate. In January 2015, the Boards of Directors of The Youth Centre (TYC) and the Oshawa Community Health Centre (OCHC) agreed to a full merger with a vision to create a new, stronger Community Health Centre, serving the communities of Pickering, Ajax, Whitby and Oshawa. The new entity would become one of the largest Community Health Centre organization in the province, serving a population of over four hundred thousand. Following a public tendering process, TYC-OCHC transitional committee engaged Argyle Brand Counsel+Design to undertake a strategic branding exercise aimed at developing a new institutional name, visual identity and brand marketing strategies to build awareness of the new name and of the expanded programs and services available in various communities. The new organizational brand priority goal was to help communicate an expanded mandate and set of services to be delivered to a broader audience from a number of community centres and clinics situated across Durham region, from Pickering to the west, to Oshawa to the east. In order to address anticipated reluctance to name and culture change across internal stakeholders working in various sites, ABC+D developed a new Brand Manifesto developed using various insights gained from the stakeholder research and consultation throughout the process. Today, the rebranded organization known as Carea Community Health Centre is already getting a lot of traction and the new brand has become a fixture in the communities within Durham region. With office in every major market in Canada, GWL Realty Advisors, a subsidiary of Great-West Life Insurance Company, is one of Canada’s premier property management and development companies. In 2011, GWL Realty Advisors engaged Argyle to assist the company in optimizing its brand positioning to align with fast-evolving market conditions and to refresh its brand image and communications approach to reflect this new positioning. Our process began with a review of the market positioning of various peer organizations, both domestically and abroad. We then followed up with a thorough assessment of the company’s brand identity. Clients, employees and stakeholders were consulted in this process via interviews, group discussions and surveys. This process resulted in a deeper understanding of the brand opportunities and led to the redefinition of the market positioning and of the expression of the company’s unique value proposition on a national stage, as well as to the consolidation of all elements of communications for all customer touchpoints, in order to better reflect key areas of specialization of the company. (French: « Des conseils à la hauteur » ) as well as a message matrix to address the various audiences, services and customer touchpoints. – We developed a dynamic new visual identity system and comprehensive brand usage guidelines. formats and a number of print marketing collateral and corporate materials. – We further assisted the company in creating a new Leasing and Development sites signage approach. What does a respected organization do when its brand and name no longer fit the reality of its mandate and vision? While vice president branding and strategic design with at the Publicis Group – Jean-Pierre Veilleux led the team in the development of a new brand positioning and visual identity for the institution colloquially known as “Whitby Psych”. Whitby Psychiatric Hospital began its life over 90 years ago as the Ontario Hospital for the Insane, Whitby, which then became Whitby Mental Health Centre. With the devolution by the Province of Ontario of mental health hospitals, the new community-based board of directors and senior management team began the journey to transform the hospital into a leader in mental health care. Following an extensive stakeholder consultation and strategic planning process, the hospital recognized that its name was not representative of its role as a province-wide facility with a focus on patient care, research, teaching and advocacy. We had a very short timeline. In less than five months we worked intensely with a small team of the senior leadership while consulting with over 500 stakeholders using multiple techniques including an online forum, interviews, town halls and brand events. The results were used to produce a brand and name strategy that provided the criteria for the development of a new name for the organization and visual identity options. The new name has two parts. Ontario Shores relates to the location and to the broad province-wide catchment area. Centre for Mental Health Sciences responds to the view of mental illness as an illness with a scientific basis of study. The new name and visual identity revivified the organization. Patients, staff, board members and volunteers embraced the new name as a symbol of the future direction of the hospital. In a market research study, the new brand was viewed as more modern and innovative and the organization was viewed as prominent teaching hospital, moving mental health to the 21st century and providing excellent patient care. The new brand was also recognized through national and international awards. Engagement, research, brand strategy, naming, visual identity, brand-based communications planning. and consistently applied to all brand touchpoints across the organization.